Bacon and egg pie, Lancashire hotpot and steamed puddings. The food guru's history of 20th-century British cooking. From April 1999. Bacon and egg pie, stewed eels, eel meuniere, chicken and veal pie, Lancashire hotpot, dumplings, quail pudding and steamed pudding. Food guru Marguerite Patten's classic recipes from the homely post-war years of 20th Century's third decade - in her 10-part history of British cooking. Marguerite told us how to make the most of our rations during the Second World War in 'Kitchen Front' on the BBC Home Service. 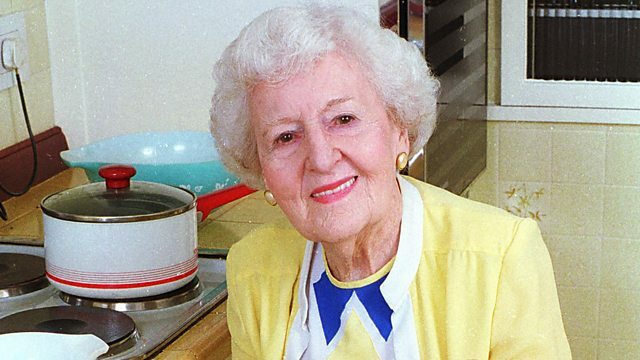 She fronted her first BBC TV cookery show in 1947. Born in Bath, the home economist was widely considered to be the first celebrity cook, and wrote more than 170 books with worldwide sales of 17 million. A regular contributor to BBC Radio 4's Woman's Hour programme from 1946, Marguerite's final appearance was in 2011. She was awarded the OBE in 1991 and CBE in 2011. Born November 4th 1915, Marguerite Patten died just a few months short of her 100th birthday in June 2015.